Christian version of the Eye of Providence or the all seeing eye. It is clear that we make symbols, like the all seeing eye, in order to communicate ideas. But we also make symbols to help ‘communicate and understand higher truths that are veiled or hidden to ordinary consciousness’. Symbol making has been a deep-rooted characteristic of humans since at least the times of hunter gatherers. Previously, in part 1 of The Legend of the “Eye”, we focused briefly on the Egyptian symbol of ‘the eye’ and its association with Egyptian Gods. 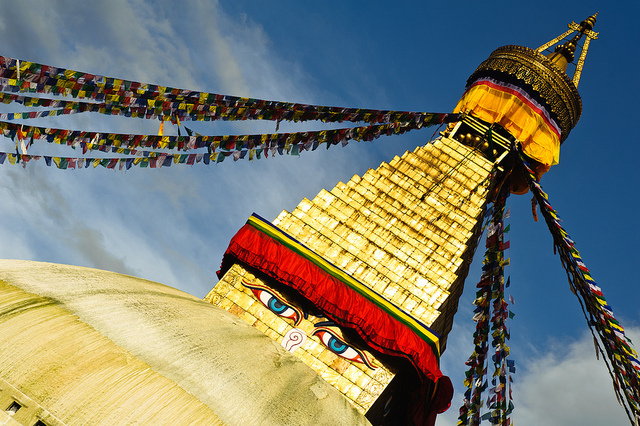 In this instalment we will focus our attention on ‘the eye’ and its forms and connections with Hinduism, Buddha and Christianity’s ‘eye of providence’. We sometimes hear about the term ‘the third eye’ or ‘inner eye’. It is a mystical and esoteric concept referring to an invisible eye which provides perception beyond that of ordinary sight. It is often associated with religious visions, clairvoyance and out-of-body experiences. In some traditions as Hinduism, the tilak, a mark applied to the forehead by the smearing of powder or paste, is a visible sign that the person in question practices the Hindu religion. The tilak doesn’t have a standard shape or colour, as it is applied differently across different Hindu sects. The mark is positioned between and slightly above the eyebrows, symbolizing the wearer’s aspiration to elevate higher consciousness in order to open up his or her mystical third eye. The Shiva, “the Auspicious One” (pictured on the left) in the 1820 Rajput painting, is a popular Hindu deity. One of the most recognizable attributes of Shiva is the third eye on his forehead. An Indian women (on the right) with the tilak and birdi. The birdi, is the most frequently worn type of tilak, a decorative dot worn by women as a sign of marriage. Buddha, the awakened or enlightened one, is often mistaken for having a third eye. In fact, his circular mark on the forehead is called the urna. It appears as a concave circular dot that represents a whorl of white hair which is the 31st of the 32 physical characteristics or marks of Buddha. The Urna symbolizes ‘the emptiness and purity of all phenomena’. The Urna was said to project rays of light to the deities in the god realms announcing that the Buddha was going to deliver teachings on earth. It also symbolises his power to illuminate the world. Out of sympathy, the Buddha directed his light of wisdom to first placate the suffering of the living in the lower realms. 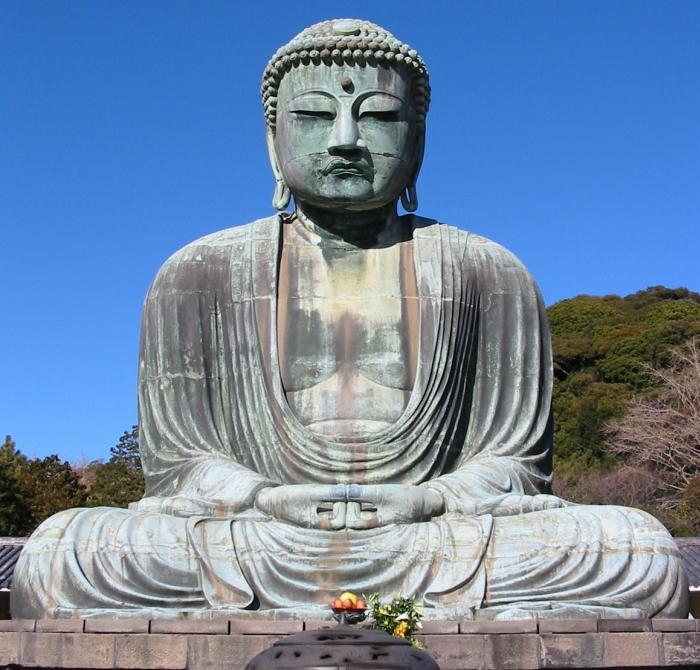 In Buddhist texts like the Mahaparinibbana Sutta, Buddha is also referred to as the ‘Eye of the World’. This is somewhat interesting because the ‘Eyes of the Buddha’ are often detailed on stupas, hemispherical structures or monuments. The dramatic eyes of the Buddha, look out in four directions, representing the all seeing wisdom of the Buddha. Beneath his eyes, as seen in the picture below, there is what appears to be a nose or question mark. This is, in fact, the number one in Nepalese script. It symbolises the non dual nature of phenomenal appearance and the mystical unity of all things. The use of the eye to represent God or deities such as in Hinduism, also found its way into Christianity. During the renaissance period in Europe and in iconography of the time, the image of the eye was often shown surrounded by rays of light or a glory and usually encircled within a triangle. It is sometimes referred to as the eye of providence or the all seeing eye. 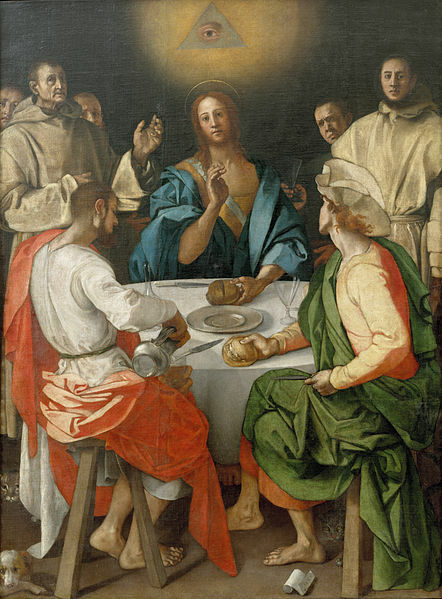 A 1525 Jacopo Pontormo painting using the Eye of Providence in a triangle as a symbol of the Christian Trinity surrounded by clouds or sunbursts. The Christian version of the eye of providence emphasizes the triangle as representing the trinity. (The father, the son and the holy spirit.) It is also interpreted as representing the eye of God overseeing or watching over his flock or mankind. This emblem in a similar form was eventually adopted by the Freemasons as a symbol for the Great Architect. Reblogged this on Classical Mythology. I love the image on the bottom. It makes Jesus look like a Freemason. It’s funny how imagery and our perception of it changes over the centuries.